This past week, I was invited to my very first book signing. 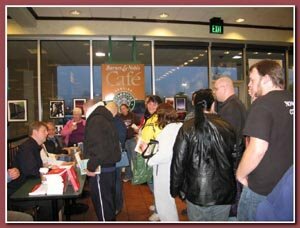 I have to say up front that the very notion that I would be invited to a real book signing is just overwhelming. “Nana” has been published for about five months now and I still can’t used to what’s happened since then. I am still amazed to see my book on Amazon.com. I have been contacted by strangers who read the book. I’ve been in touch with a cousin who worked for and lived with Nana for a few years and shared many untold stories. I’ve received emails from Nana’s brother Neil’s grandson, who said the pictures of his grandfather on my web site were the first he’d ever seen. Another gentleman served as an altar boy for Nana’s pastor and said my characterization of the priest was exactly right and added more of his own memories of life back then, the time of Nana’s childhood. He also included eighty pages of my family tree going back 200 years, which he compiled. Other writers helped me locate the Gillis farm. Some have even offered to guide me there when I visit Nova Scotia. One friend said she cried reading the last part of the book. Another read the book as her mother lay dying and she said the book comforted her. It’s overwhelming. It’s also very humbling. I entered the store and located the table, with the four author’s books in small piles and a display copy up front, and thirty or so chairs set up. There was my b ook, second from the left! I’m going to be on the OTHER side of table. People will be asking ME to sign something. Well, people did come, I think about forty or fifty in all, to see the four of us. Each author spoke a bit about our books; I talked about how valued the elderly are, and how important it is to ensure they grow older in dignity, respect and quality of life, that we listen to their stories and learn from them … I talked about how I grew up the day Nana died, and how I realized she had been the one taking care of me all those years, I just didn’t realize it. I added that I was surprised that the book also helped me make peace with my Dad and his legacy as well. That’s a lot of healing in one book! It was a thrill to meet and listen to the other authors, two of whom were also first-time published like me. Patricia Forbes, author of “Healing Life’s Broken Dream” has endured many tragedies in her life, but the worst was watching her 21 year old son die in a traffic accident, and having to take him off life support two days later. The loss drove her to the edge of despair lasting for years, but this remarkable woman has rebuilt her life and written this moving story of survival and renewal. John Cardano, author of “The Fabric of Health,” is a Vietnam War veteran (thank you!) and was wounded in combat and suffered great physical pain for years. This indomitable man overcame his own pain and has embraced healing and homeopathy to assist others. He shares insights and experiences that enabled him to change from a life of chronic pain to living a life of health and happiness. Dave Kane, who wrote “41 Signs of Hope” is a well known New England talk-show host and quite personable. Dave was the father of the youngest victim of the Station nightclub fire, which as you know took the lives of 100 people in West Warwick, RI. Through his grief, Dave has produced an inspiring book that documents a long series of unmistakable messages received from his son Nicholas O’Neill. “People don’t die,” he told me, “they pass on to another place but are always with us.” You see and hear the signs everywhere: The song on the radio, the rainbow, and the “coincidences” that happen every day. Well, back to the signing. After we authors all spoke, the crowd came up to have us sign our work. As my wife Susan snapped pictures and looked so proud, I was happy to see friends from around Foxboro, as well as friends I’d worked with at other jobs. Many people I’ve never met also bought a copy. Hearing people telling you they are proud of you, having them ask you to sign your book, or even better, telling you how much they enjoyed your book … Well, it’s overwhelming. Absolutely, positively, overwhelming. I tried to write something appropriate and personal in each signing. I wanted my words to mean something. This morning, I feel a variety of positive emotions. I am so thankful to have been invited, so appreciative to everyone who came to the signing, so honored to have had the opportunity to speak with three gifted authors and to look forward to reading their books in the next few weeks. For all this and more, I am so very grateful. And I also feel very humbled. When Nana died, she was 91 and had lived a long life, and I was still inconsolable for years. But two of the other authors wrote of their children they had lost at ages 18 and 21. The death of an elderly grandparent is expected, but not the death a son just out of his teens. Both Patricia and Dave wrote of these losses in their books. How do you handle that? How do you go on? How can you even survive? John faced unbearable pain, diagnosed as incurable. How do you go on? How do you survive, and live again? These authors found the way out, the way back to the light. All irrevocably changed, yes, but able to function again, to live, to find a level of peace, and to pass along this hope, renewal and faith to others. They came back from the darkness. They found the way out. And they want to share how they did it. God bless them. I am indebted to everyone who supported my writing over the years, especially Sue, my Mom and sister Theresa. But ultimately, I am most grateful to both Nana and Dad, who not only surprised me by working through me to help me put their stories to paper, but helped me accept Nana’s passing and make my peace with Dad as well. Pretty heavy stuff, I know, but it’s real. I hope I get to do more signings. I know my book is not the next million-copy bestseller but I want to get the story out there, to share it with everyone. I want to meet more authors and share their stories, and want to meet people and invite them to share my story and hear what they have to say. This is better than I could have ever imagined. I am humbled, and profoundly grateful for all of it. NanaGillisBook has a new web site!